Review: 2014-11-15, Fabricio Werdum vs Mark Hunt gets three stars thanks to a spectacular finish (UFC Performance of the Night). The black belt in judo and Bjj Fabricio Werdum entered this fight with a professional mma record of 18-5-1 (78% finishing rate) and he is ranked as the No.2 heavyweight in the world, he suffered his last defeat in 2011 when he faced Alistair Overeem (=Overeem vs Werdum), since then he has won four consecutive bouts, the last one against Travis Browne (=Werdum vs Browne). His opponent, the 40-year-old and former K-1 world champion Mark Hunt (three years older than Werdum), has an official record of 10-8-1 (70% ko/tko victory rate – he has never won via submission) and he entered as the No.4 in the same weight class but he won just one out of his last three bouts, against Roy Nelson (=Hunt vs Nelson); before this fight he had lost to Junior dos Santos (=dos Santos vs Hunt) and then drawn against Antonio ‘Bigfoot’ Silva in one of the best mma fights of 2013 (=Silva vs Hunt). 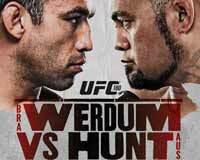 Werdum vs Hunt, main event of Ufc 180, is valid for the interim UFC heavyweight title; Hunt replaces #1 Cain Velasquez who was forced to pull out of the bout due to an injured knee. Watch the video and rate this fight!